Did you like our key collection system Key'n Go? If you are looking for the fastest way to start, Goldcar offers Click'n Go, a service with which you can access your car with just a single click of your mobile phone, without going to the counter and without keys. 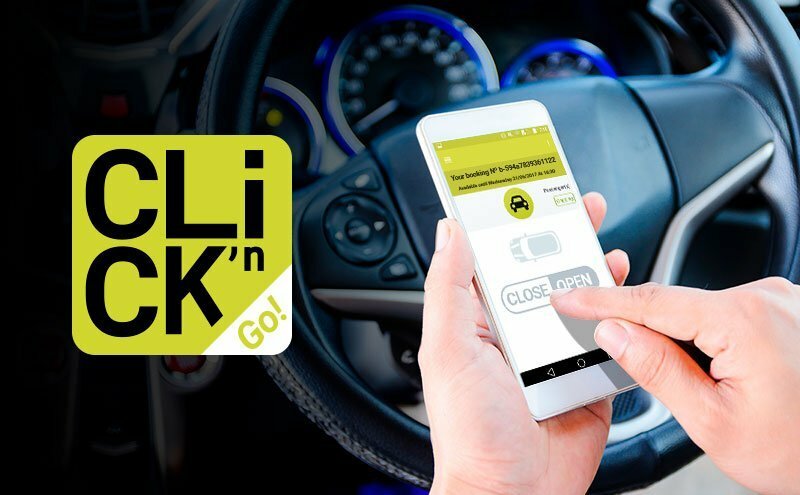 With Click'n Go the user is informed of the parking space in which the vehicle is located and also the virtual key before the time of collection of the car. NOTE: The user of this service package should only need to have an up to date mobile phone, with an internet connection, Bluetooth and iOS (9.0 + ↑) or Android (5.0+) operating system. Now you can enjoy this innovative service from offices such as Alicante,Barcelona, Malaga, Madrid or Mallorca. How can I hire using a Click'n Go? You will receive an email with the link to download the Click'n Go application, along with the necessary access details - in the case of being your first booking. Download and install Click'n Go . When the date of your booking approaches, you will receive a notification of the location of your car on your phone. During the 12 hours prior to the collection of your vehicle we will send the virtual key to the app so you can open the car and start your journey. Find your vehicle in the parking following the directions of the Click'n Go app and stand next to it to open it. Now you can enjoy your trip! Does not include franchise and no deposit to block on your card. The possible damages are covered. Beklager, en feil har oppstått. Vennligst prøv på nytt. Denne e-postadressen er allerede registrert hos Goldcar Club. Du kan logg inn eller gjenopprette passordet ditt. Gratulerer! Du er i ferd med å bli medlem av Goldcar Club. Det gjenstår bare å bekrefte e-posten vi nettopp har sendt deg. Klikk på linken i meldingen og begynn å nyte alle fordelene med Club Goldcar. Logg inn på klubben nå.